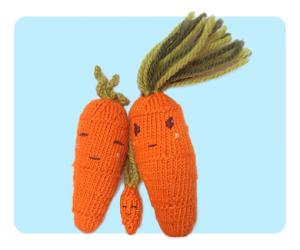 Free Tiny Baby Carrot Cute Free Knitting Patterns, Very Tiny and Cute! 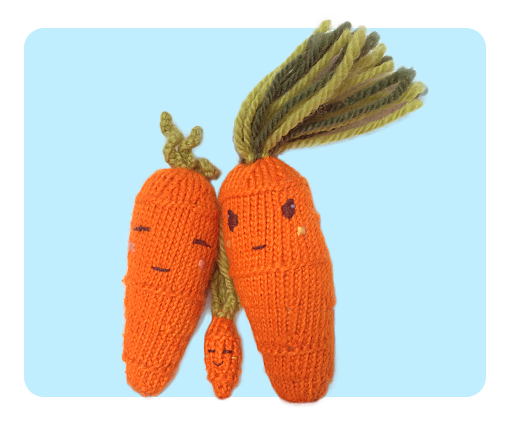 “Mommy, where is the baby?”, said my 3yo son after looking at the finished Sweet Carrot & Cool Carrot together. Well, that’s how this Baby Carrot came about. 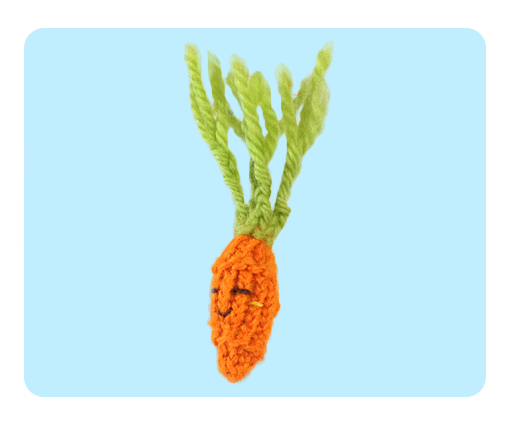 Baby Carrot is very tiny — knitting him was quick and easy (he is like a miniature version of the other carrots). However, I gave him a different hair for fun, the green tops are cut slightly uneven and braided. I left the green tops long, but I think it will look good too if cut short. *Important* Please note that due to it’s tiny size, this is not a toy for small babies under 3yo due to potential chocking hazards. With DPN and Orange, CO 3. Divide 1 sts on each DPN. Round 18: *K1, K2tog* 6 sts total) Stuffed body a bit more now so everything is tight. 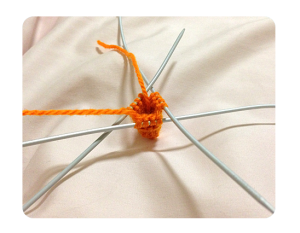 Cut the Orange yarn, and leave approx 10cm tail for seaming at the end. 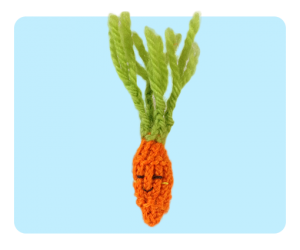 Now, you want to repeat the Cool Carrot green tops procedure. 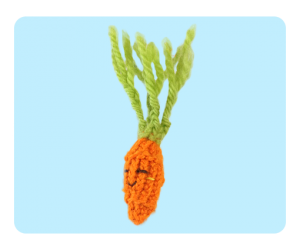 I have written a detailed instructions with video tutorials on how to do the hair in my Cool Carrot post, please refer to it there. 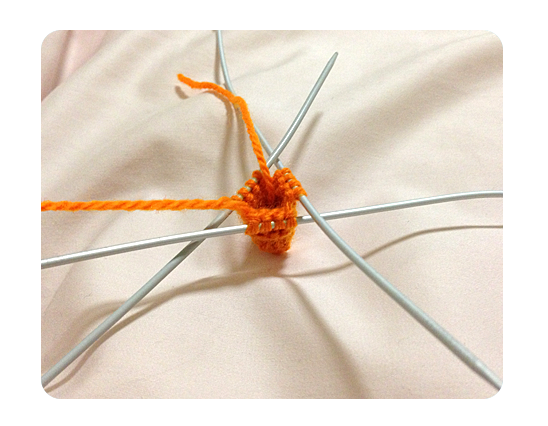 The difference is that you may want to cut your yarns after you finished tying the slip knot so it’s easier to handle as you don’t want to cut it really short and having trouble tying the knots later on. After you finish tying the knots, I braid the hair using 3 strand braid technique, then I later trim the hair to desired length. 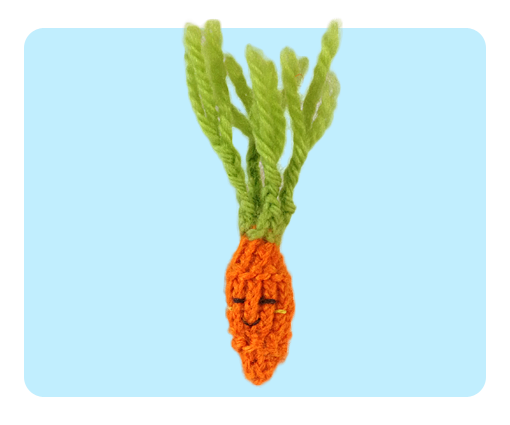 (DPN) double pointed needles, carrot stuffed toys, cute amigurumi toys, easy knitting patterns, face embroidery, free knitting patterns, kid toys, knitted food, knitted toys. Bookmark.